Daimler AG and Zhejiang Geely Holding Group have formed a 50:50 joint venture to develop smart-branded new generation electric vehicles, to be assembled at a new purpose-built electric car factory in China with global sales due to begin in 2022. The board of directors of the new smart joint venture will be made up of six executives with equal representation from both parties. 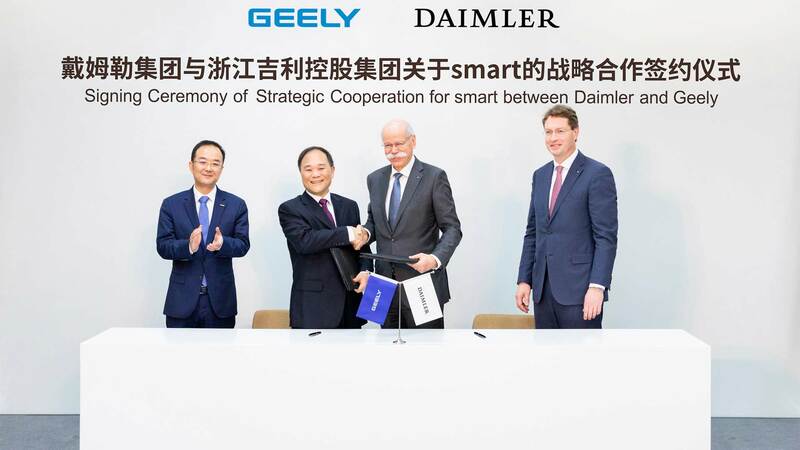 The JV partners have agreed that the new generation of smart vehicles will be styled by the global Mercedes-Benz Design network with engineering from Geely global engineering centers. Future production will be based in China. The smart product portfolio is also planned to be extended into the fast-growing B-segment. Prior to the launch of new models from 2022, Daimler will continue to produce the current generation of smart vehicles at its Hambach plant France (smart EQ fortwo) and at Novo Mesto (Slovenia, smart EQ forfour). In parallel, the Hambach plant will assume an additional new role in the Mercedes-Benz Cars production network and will produce a compact electric vehicle under the EQ brand in the future. Mercedes-Benz is investing €500 million on the Hambach plant. The joint venture is expected to be finalized by the end of 2019. Financial terms of the smart joint venture have not been disclosed. “For more than 2.2 million customers, smart represents a pioneer in urban mobility. Based on this success story, we look forward to further enhancing the brand with Geely Holding, a strong partner in the electric vehicle segment. We will jointly design and develop the next generation of smart electric cars that combine high-quality production and known safety standards for sale both in China and globally,” said Dieter Zetsche, Chairman of the Board of Management of Daimler AG and Head of Mercedes-Benz Cars.